and the people who are going to be 10 years old." Sen to Chihiro no Kamikakushi is a fantasy adventure with a ten year-old girl, which starts in everyday Japan but goes somewhere very different. For young Chihiro and her family, a mysterious tunnel and haunted town lead to the Land of Spirits, inhabited by gods and monsters and ruled by the greedy witch Yu-baba. 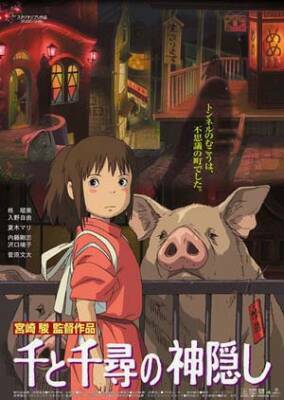 Chihiro's parents are transformed into pigs; to rescue them, she must surrender her name and serve in this world. Luckily she finds friends and allies, including the handsome but mysterious boy Haku. Initially sulky and listless, Chihiro (or Sen, as she's now called) finds inner strengths and establishes an identity in this strange world. But can she win back her name and return home? Images, characters, and story © 2001 Nibariki, TGNDDTM (Tokuma Shoten, Studio Ghibli, NTV, Dentsu, Disney, Touhoku Shinsha, and Mitsubishi Commercial Affairs).